Conor Tool is proud to make quality items for your workbench and your home that last. If you're not 100% satisfied with our product contact us and we'll make it right (contact information provided in your order). Refer to images and product features listed above for product details. FITS MOST PEGBOARDS - Examine 4th product image. 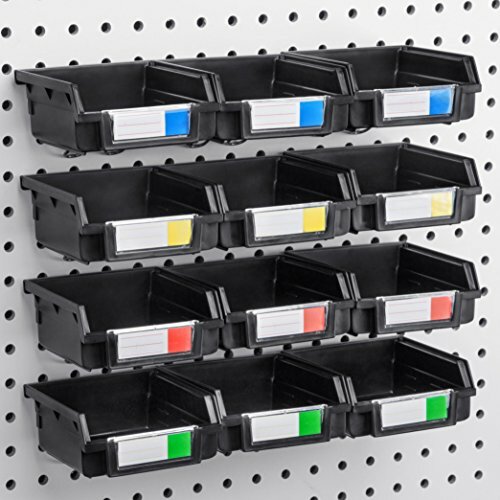 Pegboard bins fit 1/4 and 1/8 inch hole diameter pegboard with up to 3/16 inch pegboard thickness. Must have 1 inch on center holes (1" between holes). GREAT FOR METAL AND NON-METAL PEGBOARDS - Fits Wall Control pegboards, Triton pegboards, and other common pegboards - see 4th product image to ensure your pegboard meets fitting requirements. STRONG HOLD - Bins are mounted by metal hook attachments. Many bins are mounted by plastic peg hooks that can snap or break while installing or during regular use - these bins with metal hooks are built to last a lifetime. SIZE - Bin dimensions are 3.5" X 3.5" X 1.8"
ORGANIZE BETTER - Holds small parts, hardware, screws, washers, small tools, tape measure, etc. Perfect for organizing work bench, shop, craft room, basement, or garage. If you have any questions about this product by Conor Tool, contact us by completing and submitting the form below. If you are looking for a specif part number, please include it with your message.